As adults, we tend to become accustomed to our unique physical features. A freckle on the cheek or a streak of gray hair isn't something we'd necessarily want to change. However, crooked teeth can make people feel self-conscious about the way they look, but braces can call too much attention as well. That's why the team of dentists at Dentistry by Design in Andover, MA, offer Invisalign, a discrete, comfortable, and effective way for adults to straighten their teeth. Learn how Dr. Jhon Giraldo, Dr. Leo Kharin, and Dr. Nicholas Papapetros help you straighten out your smile on your terms! 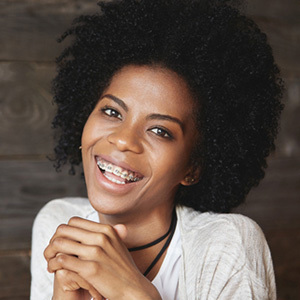 Invisalign uses the science behind traditional braces - placing pressure on the teeth to move them into the proper position - by transferring that method into clear, flexible plastic trays called aligners that fit directly against the teeth. These aligners are made in a series so they can be switched out to continue the process as your teeth move into place. Not only are these aligners practically invisible to others, they can also be removed so you're free to eat what you like without fear of damage. For best results, your Andover dentist suggests that your Invisalign trays should only be removed at mealtimes. They can then be replaced in your mouth after you brush your teeth. We'll show you the best way to keep them clean. 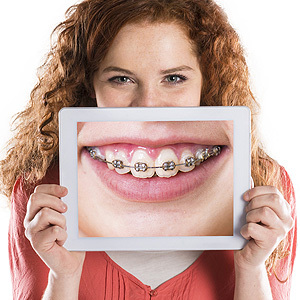 Each of our patients' alignment issues are unique, so treatment time and number of aligners will vary. It may only take a couple months before your teeth begin appearing more even. On average, many people see final results from Invisalign within a year to 18 months. One way you can make sure you're on schedule is by following your Andover dentist's recommendation to wear your aligners every day for at least 20 to 22 hours. If you're ready to get started on your new and improved smile, contact Dentistry By Design in Andover, MA, and ask to set up an appointment with Dr. Kharin, Dr. Giraldo, or Dr. Papapetros today!